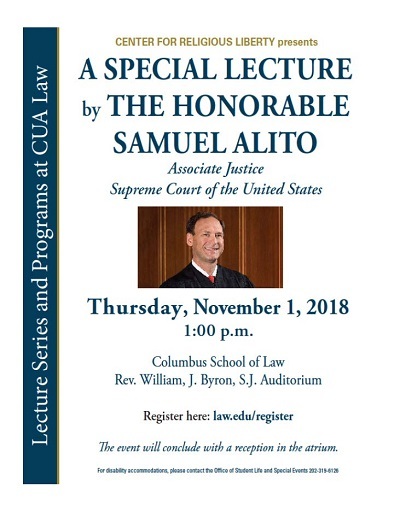 On November 1, 2018, the Center for Religious Liberty and the Catholic University School of Law hosted a special lecture by The Honorable Samuel Alito, Associate Justice, Supreme Court of the United States. Justice Alito was nominated by President George W. Bush to fill the seat vacated by the retirement of Justice Sandra Day O'Connor. Alito was unanimously rated "well qualified" to fill the associate justice post by the American Bar Association's Standing Committee on Federal Judiciary. He was confirmed by the Senate and assumed office on Jan. 31, 2006. Justice Alito is the 110th justice and the fifth Catholic to serve on the Supreme Court. At the 2008 law school commencement ceremony, Justice Alito received the Doctor of Laws, honoris causal degree from The Catholic University of America and delivered the commencement address to the graduates of the Columbus School of Law. Alito, Samuel, "A Special Lecture by the Honorable Samuel Alito" (2018). Other Lectures & Events. 15.